Why would the display turn off during calls? This singular fact rubbished whatever advantage the Z Ultra possesses. secondly the screen cracked at the slightest provocation. For me, durability is zero. No one want to buy and expensive item and go searching for an Engineer the next minute. Lastly, as big as the phone is, the keys are small. THIS PRODUCT IS A NO GO FOR ME AND CAN'T RECOMMEND IT. I've got a Samsung s7 edge and it's a damn good device.. but you'd have to prize my Z ultra from my cold dead fingers before I'd part with it. According to my performance it's awesome in all the performance, but only one problem is there is 32 bit operating system, overall Is excellent. Aya, 17 Aug 2015This phone is just simply awesome. I love this phone, it got Sony's finest build quality and t... moreSony xperia z ultra supports reliance jio 4g lte sim card?? I love my z ultra, is the best phone I've got. This phone is just simply awesome. I love this phone, it got Sony's finest build quality and that premium looks that make people stare at you when using this phone (this seriously happened to me). I don't care about the camera and the lack of flash - i bought and needed a phone, a mini phablet to a certain point, not a camera. Display is simply gorgeous. Especially when watching videos. You can do like, just anything on this phone. I am a writer, and the Z Ultra has been my best friend for office and writing stuffs. Plus it has Lollipop, it has LTE, what could you ask more? And dont forget those exclusive Xperia themes. This phone is top notch. Well done Sony. Is it safe to buy z ultra or note 3? AnonD-368936, 28 Feb 2015I bought it & I care for it just like a baby but all in vain breaks itself & than so... moreI am not sure how you managed to break it.I have dropped mine like 15 times onto concrete and nothing happened.To be fair,I do have a slim TPU case in place. This phone still beast...till now.. This is the marvellous phone In whole world.... Awesome!!! 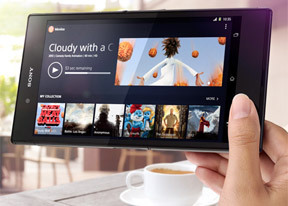 Im looking for sony xperia z ultra. Is this phone ok or not for common uses?????? prajith, 08 Mar 2015I like to buy z ultra but the only negative point is no camera flash...Dude, nobody needs flash on a camera in 99% of the shots. flash tend to ruin the shots. also for sos light you can use apps and with that gigantic display your display will show stronger light ten times more then a flash!